Leading Manufacturer of solid state relay from Nashik. We are remarkable entity, engaged in offering superior quality Solid State Relay. In accordance with predefined industry standards, this relay is precisely manufactured using high grade components and ultra-modern techniques by deft professionals at our manufacturing unit. 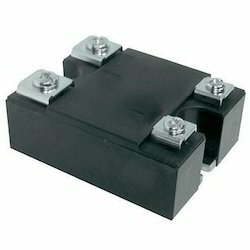 This relay is used to control the flow of electrical energy in alternating current power systems. Owing to its perfect functioning, the provided relay is widely acknowledged by our clients. We offer this relay at market leading prices.